This national treasure winds 88 miles through North Carolina's mountains. Explore it for a day or as part of a through hike with these insider tips. Everyone’s heard of the Appalachian Trail. But being a “must see” doesn’t mean it can’t surprise you. Learn more about this classically North Carolina destination, and then go beyond the guidebook with our insider tips. It’s one of the country’s most recognized and respected footpaths: The Appalachian Trail, known colloquially simply as the A.T., has been a national treasure since its completion in 1937. Whether you’re spending a few hours on the trail or making a thru-hike, which usually takes half a year, North Carolina’s portion of the trail is particularly scenic and memorable. The Appalachian Trail here is about 88 miles long, with another 200-mile section that runs on or near the North Carolina – Tennessee state line. North Carolina’s portion of the Appalachian Trail can be split into two different conquerable sections. Both offer stunning views and an abundance of natural splendor. 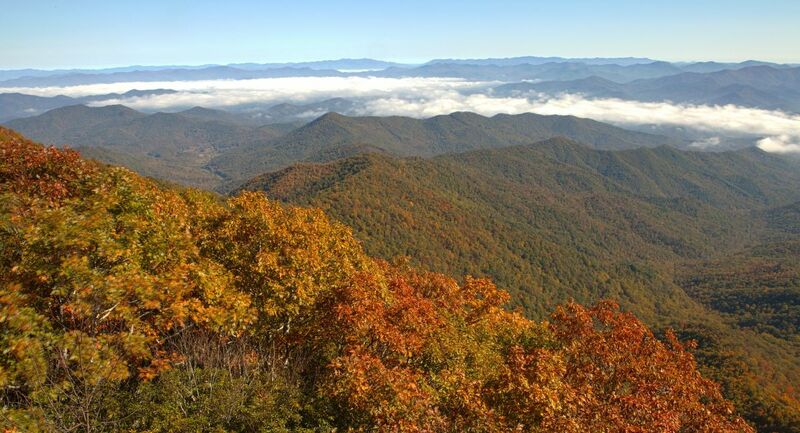 The section of the Appalachian Trail from the Nantahala River to the Georgia border features the best-graded trail at high elevations in the South, with a few short exceptions. You’ll enjoy lots of views from natural openings and fire towers, some requiring short side trips. At the Nantahala River, the Appalachian Trail climbs out of Nantahala Gorge and heads south, climbing over a series of 5,000-foot summits and 4,000-foot gaps. It flanks the headwaters of the Nantahala, Little Tennessee and Tallulah rivers. At Ridgepole Mountain, the end of the Nantahala Range, it turns to the Blue Ridge for the rest of its journey to Georgia. The Appalachian Trail in this section is entirely within the Nantahala National Forest and is mostly routed through mature, hardwood forest with long, flowing streams. Depending on when you hike, expect to see rhododendron, mountain laurel, flame azalea, mountain ash, vast beds of fern and galax, and a profusion of wild flowers. At mile marker 133.9, the Appalachian Trail runs right through the Nantahala Outdoor Center (NOC), a well-known base camp for day hikes. It’s a great re-stocking and resting place for through-hikers. If you want a little diversion from hiking, the NOC is a recognized leader in whitewater adventures, with more than 35 years of experience. The NOC offers whitewater rafting trips on the Nantahala, Ocoee, Chattooga, Gauley, Cheoah, Pigeon, French Broad, New or Nolichucky rivers. The Appalachian Trail also runs right down the main street of the town of Hot Springs, a favorite spot for long-haul hikers to take a break on their way to Maine and to rejuvenate their aching muscles in the healing hot springs. The trail here also leads to the views of a lifetime on a stretch of mountaintop that inspires wonder in hikers’ journals. You don’t have to be a serious hiker to enjoy what has been called “The Crown Jewel of the Appalachian Trail.” Be forewarned – the curvy, partly dirt road from Hot Springs to the Max Patch parking lot is challenging, but well worth the effort. Hiking along this part of the Appalachian Trail leads to the top of a 4,600-foot mountain where you can see Mount Mitchell to the east and the Great Smoky Mountains to the south. This 350-acre tract of land was cleared and used as pasture in the 1800s, but today Max Patch’s lush green mountaintop provides 360-degree views that won’t let you go. Two easy loop trails lead you to, and around, the summit. The 1.4-mile short loop crosses the summit. The 2.4-mile loop circles the mountain for outstanding views from all sides. From the parking lot, follow the marked trail to the left. You’ll ascend through a forest, and then reach the top for amazing views. The rest of the hike is on the grassy bald. You can also hike north or south on the Appalachian Trail for as far as your legs will carry you. The Appalachian Trail in North Carolina features numerous hostels and campsites. Warming huts are usually free and unlocked, but have minimal facilities. Hikers can also find hostels with running water and electricity along the trail. Get more information about the trail and the Appalachian Mountains at the Appalachian National Scenic Trail Ranger Station. There are also Treehouse Cabins along with other hotels and lodging options in Hot Springs. 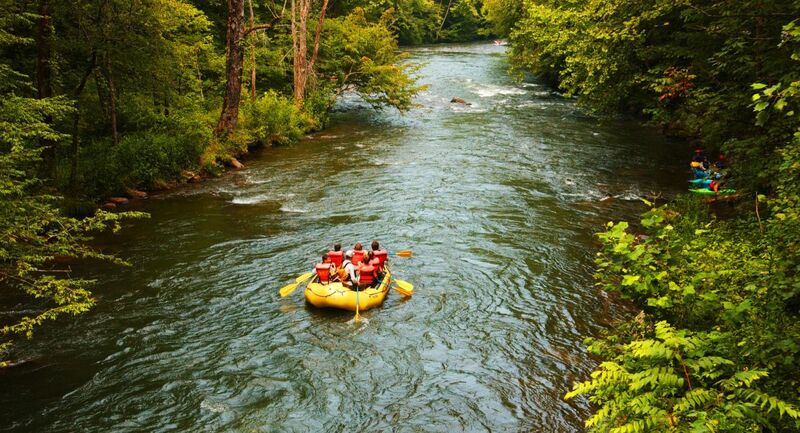 Along the Nantahala, the NOC’s Nantahala Adventure Resort offers lodging and meals. Note: The Appalachian Trail is marked with 2-inch by 6-inch vertical white paint blazes. A double blaze, one above the other, is placed before turns, junctions, or other areas that require hikers to be alert. There are approximately 165,000 such blazes along the Appalachian Trail.